Kick off your visit on the 21st (Fri): take a stroll through Bahnhofstrasse, contemplate the waterfront views at Lake Zurich, then look for gifts at Uhrenmuseum Beyer Zürich, and finally pause for some serene contemplation at Grossmunster. Here are some ideas for day two: take in the awesome beauty at Mt Pilatus, then wander the streets of Altstadt Luzern, then appreciate the history behind Lion Monument, and finally take in the views from Chapel Bridge. For ratings, traveler tips, reviews, and more tourist information, read Zurich day trip planner. If you are flying in from Switzerland, the closest major airports are Zürich Airport, Basel Mulhouse Freiburg and Bern Belp Airport. December in Zurich sees daily highs of 5°C and lows of -1°C at night. Cap off your sightseeing on the 22nd (Sat) early enough to travel to Ljubljana. Start off your visit on the 23rd (Sun): test your team's savvy at popular escape rooms, stop by Old Town Souvenirs, then take a stroll through Ljubljana Old Town, and finally snap pictures at Tromostovje. For photos, more things to do, maps, and tourist information, refer to the Ljubljana tour itinerary builder website . You can fly from Zurich to Ljubljana in 4 hours. Alternatively, you can do a combination of flight and shuttle; or drive. December in Ljubljana sees daily highs of 5°C and lows of -3°C at night. Wrap up your sightseeing on the 23rd (Sun) early enough to travel to Split. Start off your visit on the 24th (Mon): stop by Filigran Split and then explore the ancient world of Diocletian's Palace. To find where to stay, maps, ratings, and tourist information, go to the Split online vacation planner . Traveling by combination of shuttle and flight from Ljubljana to Split takes 4.5 hours. Alternatively, you can drive; or take a bus. Traveling from Ljubljana in December, expect Split to be a bit warmer, temps between 16°C and 5°C. Wrap up your sightseeing on the 24th (Mon) early enough to travel to Barcelona. Give yourself a bit of retail therapy at Passeig de Gracia and Cellarer. There's still lots to do: take in the architecture and atmosphere at Basilica of the Sagrada Familia, pause for some photo ops at Casa Mila - La Pedrera, admire the landmark architecture of Casa Batllo, and explore and take pictures at Camp Nou. To see traveler tips, more things to do, and tourist information, read our Barcelona trip itinerary maker . Getting from Split to Barcelona by flight takes about 5.5 hours. Other options: drive; or do a combination of bus and train. December in Barcelona sees daily highs of 17°C and lows of 7°C at night. Cap off your sightseeing on the 27th (Thu) early enough to catch the train to Madrid. When in Madrid, make a side trip to see Segovia Aqueduct in Segovia, approximately 1h 25 min away. And it doesn't end there: browse the eclectic array of goods at Mercado San Miguel, see the interesting displays at Prado National Museum, don't miss a visit to Puerta del Sol, and admire the masterpieces at Museo Nacional Centro de Arte Reina Sofia. To find more things to do, photos, other places to visit, and other tourist information, read Madrid day trip planning website . Getting from Barcelona to Madrid by train takes about 2.5 hours. Other options: fly; or drive. Expect slightly colder temperatures when traveling from Barcelona in December; daily highs in Madrid reach 14°C and lows reach 3°C. Wrap up your sightseeing on the 30th (Sun) early enough to travel to Lisbon. Step off the beaten path and head to Chiado and Museu Calouste Gulbenkian. Head to Feira da Ladra and A Outra Face da Luafor some retail therapy. And it doesn't end there: admire nature's wide array of creatures at Lisbon Oceanarium, explore the historical opulence of Castelo de S. Jorge, get a taste of the local shopping with Rossio Square, and wander the streets of Belém Tower. To see photos, where to stay, ratings, and more tourist information, you can read our Lisbon trip maker app . Traveling by flight from Madrid to Lisbon takes 4.5 hours. Alternatively, you can drive; or take a bus. The time zone difference moving from Central European Time (CET) to Western European Time (WET) is minus 1 hour. In December, Lisbon is a bit warmer than Madrid - with highs of 18°C and lows of 8°C. Cap off your sightseeing on the 2nd (Wed) early enough to travel to Porto. On the 3rd (Thu), pause for some serene contemplation at Clerigos Tower, contemplate in the serene atmosphere at Porto Cathedral (Se Catedral), then snap pictures at Ponte de Dom Luis I, then explore the activities along Rio Douro, and finally get into the urban bustle at Palacio da Bolsa. Get ready for a full day of sightseeing on the 4th (Fri): indulge your taste buds at Food & Drink. For other places to visit, ratings, reviews, and more tourist information, use the Porto trip tool . You can fly from Lisbon to Porto in 2.5 hours. Alternatively, you can take a train; or drive. January in Porto sees daily highs of 16°C and lows of 7°C at night. Finish up your sightseeing early on the 4th (Fri) so you can travel to Edinburgh. Kick off your visit on the 5th (Sat): explore the wide array of goods at Jenners, then don't miss a visit to The Royal Mile, and then explore the historical opulence of Edinburgh Castle. Get ready for a full day of sightseeing on the 6th (Sun): explore the striking landscape at Calton Hill, then examine the collection at National Museum of Scotland, and then take in nature's colorful creations at Royal Botanic Garden Edinburgh. To see ratings, other places to visit, reviews, and other tourist information, refer to the Edinburgh holiday planner . You can fly from Porto to Edinburgh in 6 hours. Other options are to do a combination of flight and train; or do a combination of car and train. Expect slightly colder temperatures when traveling from Porto in January; daily highs in Edinburgh reach 7°C and lows reach 1°C. Finish up your sightseeing early on the 6th (Sun) so you can travel to London. Head to Harrods and Covent Gardenfor plenty of shopping. There's lots more to do: don't miss a visit to Coca-Cola London Eye, learn more about the world around you at Natural History Museum, take in nature's colorful creations at Buckingham Palace, and explore the world behind art at British Museum. For ratings, traveler tips, photos, and other tourist information, go to the London travel planning tool . Fly from Edinburgh to London in 3.5 hours. Alternatively, you can do a combination of flight, bus, and train; or drive. In January in London, expect temperatures between 9°C during the day and 2°C at night. Finish up your sightseeing early on the 9th (Wed) so you can travel to Amsterdam. Head to Albert Cuyp Market and The American Book Centerfor plenty of shopping. 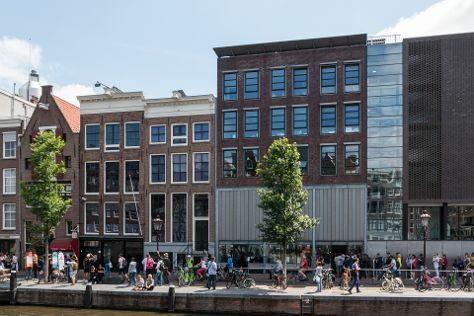 There's lots more to do: take an in-depth tour of Anne Frank House, meet the residents at ARTIS, indulge your thirst for a good beer at Heineken Experience, and explore the world behind art at Museum Het Rembrandthuis (Rembrandt House). Find out how to plan Amsterdam trip without stress by asking Inspirock to help create an itinerary. Traveling by combination of flight and train from London to Amsterdam takes 3.5 hours. Alternatively, you can fly; or take a train. You'll lose 1 hour traveling from London to Amsterdam due to the time zone difference. In January, daytime highs in Amsterdam are 7°C, while nighttime lows are 1°C. Wrap up your sightseeing on the 12th (Sat) to allow time to travel to Krakow. Head to Cloth Hall (Sukiennice) and Galeria Krakowskafor plenty of shopping. Explore hidden gems such as Stare Miasto and Wawel Royal Castle. And it doesn't end there: contemplate in the serene atmosphere at Wawel Cathedral, appreciate the extensive heritage of Main Market Square, take a stroll through Kazmierz The Former Jewish District, and pause for some serene contemplation at Bazylika i Klasztor Franciszkanow. For more things to do, where to stay, maps, and tourist information, you can read our Krakow trip planning app . Traveling by flight from Amsterdam to Krakow takes 5 hours. Alternatively, you can do a combination of train and flight; or drive. Plan for a bit cooler temperatures traveling from Amsterdam in January, with highs in Krakow at 1°C and lows at -5°C. Wrap up your sightseeing on the 15th (Tue) to allow time to travel back home.